Last Friday night's media preview of beers for the upcoming Portland Fruit Beer Festival proved a bit more lively than your typical preview, thanks in large part to some playful comments made by host and event beer curator, Ezra Johnson-Greennough. While Willamette Week Arts & Culture editor Martin Cizmar looked on, Ezra commented that Willamette Week would soon be switching to a new single page daily format. He later said not to worry about Cizmar, who would be joining Ezra's New School blog as an intern. That drew a laugh from the crowd and a lot of plastic glasses clonked together. It was all in good fun. 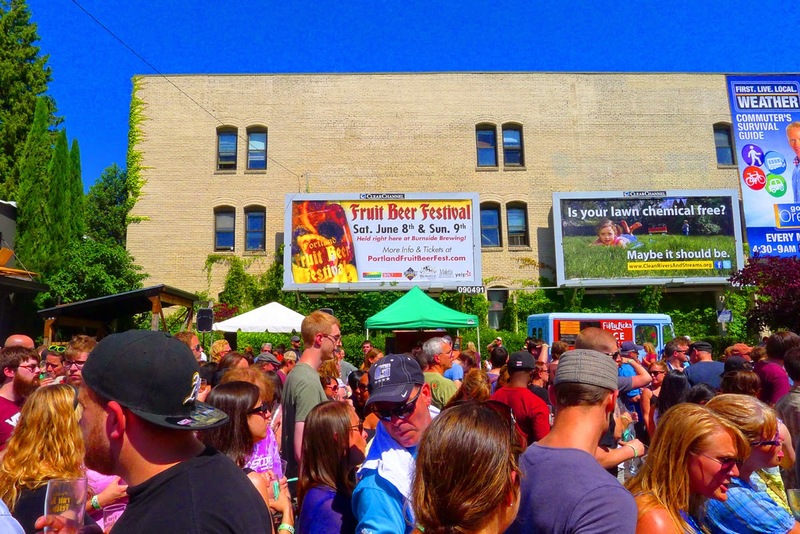 Willamette Week is a co-sponsor of the Fruit Beer Fest, along with Maletis Distributing, Burnside Brewing and a couple of others. The event is on tap this weekend at Burnside and will feature more good beers than you can shake a stick (or empty glass) at. 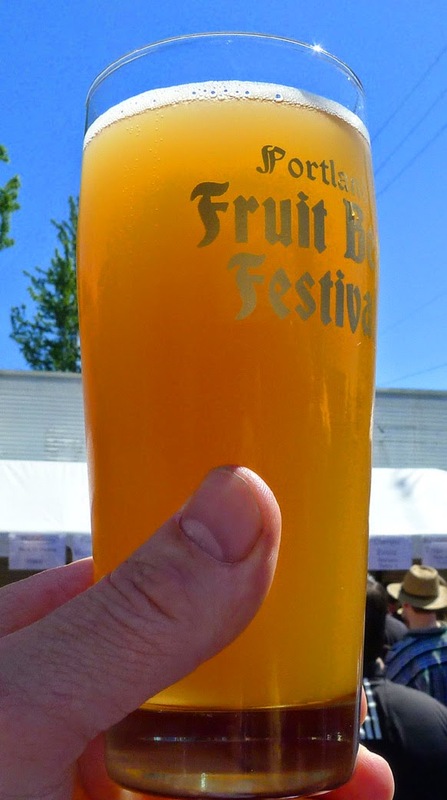 Here you have a mildly tart and highly drinkable beer produced at the brewery here in Portland. You will immediately think you're drinking a derivation of Squirt when this beer hits your tongue. Then comes the mild peppery finish, courtesy of pink peppercorns and habanero peppers. This is a Belgian-style sour ale with peach puree. It's light and the peppers are fairly subtle. Enjoy. You get it, right? Some people were thinking the name had something to do with pie. Not quite. Just a clever reference to the genetically engineered IBU rating. Anyway, this is a wheat beer fermented with strawberries and rhubarb in secondary. It's fruity and tart, yet mildly sweet. Great stuff. I had tasted this beer prior to the event and didn't care for it. (It's known as Citrus Wheat Ale at the Sandy pub). That's hard to explain because it was terrific this time out. There's a bevy of fruit in this beer...orange, lemon, lime, grapefruit. Zest and juice, they say. The low IBU is meaningless. The beer gets its bitterness from the juice and zest. A brilliant effort. This is a sour, spelt-based beer. Brewmaster Sean Burke and his helpers added Navel Orange, mandarin, lemon peel and orange and lime juice to spice things up. There was a full keg of this stuff in the cooler and a few of us stuck around after the event to do some additional research. Not to be missed. Those aren't the only good beers of those we tried, just my highlights. All are from the standard beer list. A list of rare and rotating beers just came out...nearly 25 beers, including stuff from Breakside, De Garde, Elysian, Oakshire and others. They're posted here. It's probably a moot issue, anyway, since most of these beers will be tapped randomly during the event. Watch for them in the rotating tap areas. My event advice is simple: If you aren't attending the Friday evening VIP session, arrive early Saturday or Sunday. Gates open at 11 a.m. That will give you the best access to the beers of your choice and you'll avoid long lines at least for a while. It's bound to get busy by mid-afternoon given the expected good weather. As I mentioned in my earlier post, the biggest challenge this event faces is overcrowding. Organizers are working to open up more space this year, which is great. Inevitably, though, they will have to endure the risk and added expense of moving to a larger venue. That's how successful events become even more successful. This event can have an even greater reach.